The free standing steel tube leg design and heavy-duty plastic construction will accommodate a child throughout the diapering years up to 40 Lbs. The cantilever hinging system allows the ShowerBaby® to fold out over the commode bowl providing strong safe support at a comfortable working height. 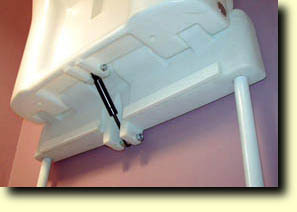 The slip-on cantilever hinge also makes the ShowerBaby® portable and easy to assemble. The top of the hinge has a water catch area so the ShowerBaby® can be raised for quick access to the commode without drying it first. 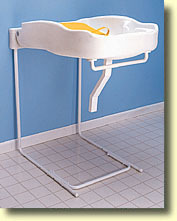 The ShowerBaby® stays in the upright position by the air spring which also allows the unit to lower slowly.